Learn how we can use the Bing Maps in Universal (Windows Store/Phone 8.1) WINRT apps. By Creating a Universal app, you will get two projects, project for windows store and project for Windows Phone by sharing the shared project. Below is the Base URI used to launch the Bing Map by passing the required parameters in query string format. This section describes to pass Latitude, Longitude and Zoom parameters as query string to Bing Map. 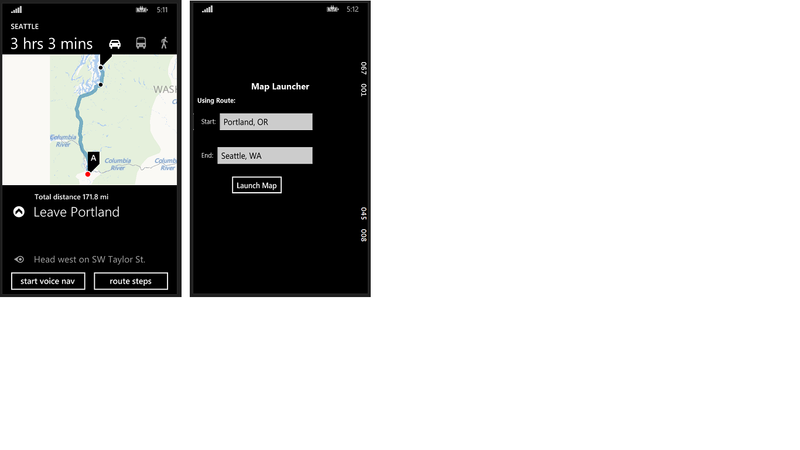 a) Create simple UI to input Latitude, Longitude and Zoom values and Button to launch the Map. b) Input the values and click on Button, format the query string by taking the values from UI in button click event as below. If you want to search by location or address, then you just need to specify the search query either with location or address. If you search with address like School in New York, Map will show the list of schools in New York with full address. b) In button click event, Pass where and what location details as query parameter and format the uri as below. If you want to search with Start and end point, you just need to specify the start location and end location. The start and end location will be pointed in the Map with directions. a) Create an UI to enter start and end location with button to launch the Map. b) Format URI for as below. If you are developing an app in Windows Phone 8.1 silverlight, please follow below link.